How did America build a war winning military that deployed tanks, airplanes, and cutting edge combat divisions? This issue tells the story of the rise of American military doctrine in the late 19th century, the Spanish-American War, and the herculean efforts to build a modern military. It also shows how the AEF fought and won big battles on the front lines of one of the greatest wars in history, as well as establishing the foundations for the US military that triumphed in World War II and remains a major force on today’s global scene. 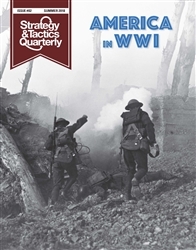 This issue includes analysis, maps, orders of battle, descriptions of weapons, and biographies of notable military figures such as John Pershing, Billy Mitchell, the young George Patton, and Homer Lea, plus a map poster.